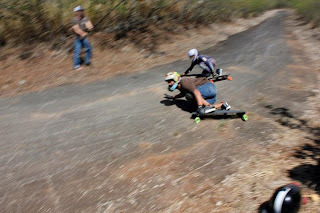 The Scorcher 2 Invitational, “ Hawaii’s Gnarliest Race” was the second event of the Hawaii Winter Outlaw Series and it had no problem living up to its reputation. Over 20 racers from several Hawaiian Islands came together on October 15. 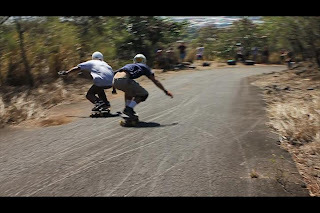 Meeting on the island of Oahu at the Scorcher…every one of them prepared to shred, or get shredded. The Scorcher is a fairly short, steep road with 4 back to back hairpins, completely closed to cars. To top it off it has some of the worst pavement you could possibly ride. Cracks, holes, grass, gravel, glass, metal, w concave... straight epicalness. Sadly this year the first right hand corner was closed off, so we just built a start ramp instead. But it wasn’t all danger, thanks to Ben Field, we had peat moss bales on the fastest corner to make crashes a little more comfy. After setting up heats and having a quick riders meeting the skating began. 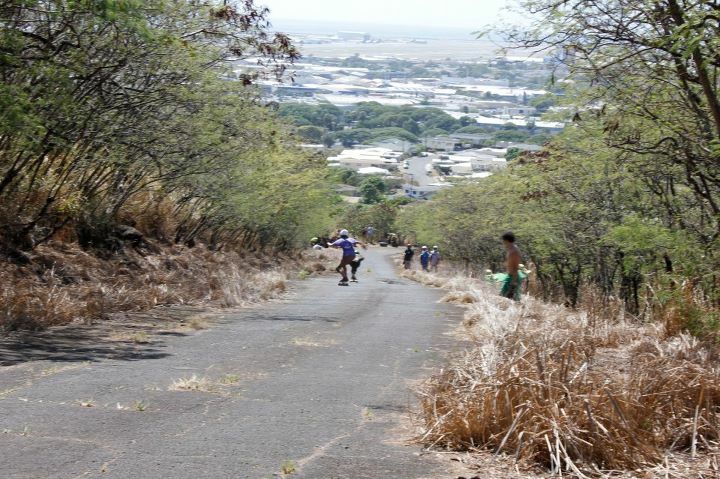 Riders were given some time to get used to the hill and the crashes started instantly. Some skaters started half way and worked their way to the top while course vets rushed. No matter what the approach was, finding the right line was definitely a challenge. 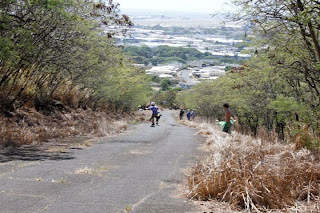 Everyone got comfortable, and we were getting ready to start round 1, when we noticed a few friendly officers from the Honolulu Police Department sitting at the bottom of the road. We took a few minutes and waited to see if they would come up the road for a talk, but they continued to sit there. So we went on and started round 1 of the race. Due to the conditions of the roads, the heats in round 1 were all head to head. This event was an invitational, so there were nothing but rippers paired up which made for some intense racing. In most heats riders stayed close off of the ramp and into the first left which required no drift this year. Next riders hit the steep straight away, filled with deep pot holes leading into the next right hairpin. This is where it showed who really wanted it. Some skaters took it easy throwing in a few carves or a foot break, and some would charge hard. 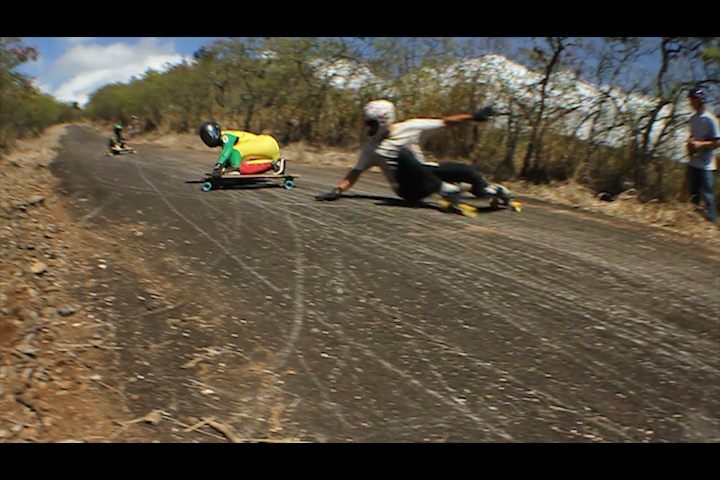 There were TONS of critical moves being made in this round, some even resulting in heavy crashes. After about 10 heats of heaviness, 10 skaters made it into the next round. Now we were also informed that the Police decided to leave and let us have our race?!? The second round went a lot like the last... Head to head heats, riders taking spills and some thrilling passes going down. Surviving the second round, making onto the next round was Ethan Lau, Brian McOuat from the Big Island, Mason Valenzuela, Eric Sato and Keola Chu. Since now we have an odd amount of racers, they chose to do a two man heat, and make the other a three man. To make things a little more even the top two riders would make it out of the three man heat. In the two man heat Ethan and Brian got paired up. Ethan got ahead from the start and kept a clean line like he had been all day… resulting in a win. Our first three man heat of the day decided not to start with the ramp, but with a one push instead. Coming around the first corner into the straight it was Mason in front, followed by Keola then Eric. The drifts into the right were clean and on point. Mason still in front and Keola and Eric now side by side. As they are in the straight leading into the next turn Eric decides do go for a push to try to get ahead before the next turn, but looses balance and stumbles. Mason and Keola continued into the last corner while Eric jumped back onto his board to finish the race course. From the crowds point of view it looked like it was set for the finals. But when the heat came back up we were informed that Mason had fell in the last left of the course allowing Eric to pass him! The 3 man heat proved to be gnarr! The final three riders in The Scorcher is now Ethan, Eric and Keola. The racers were given the option to run a round robin style race, or another 3 man heat. None of the racers hesitated to run another 3 man. For the start racers used the odds man safe/ rock, paper, scissors method to determine start position. Keola ended up on the inside, Ethan in the middle and Eric on the outside. They started with a one push start Ethan pulling out in front, closely followed by Keola then Eric. Racers stayed close in the first left then started to spred out in the straight. Coming into the right riders were flying. Ethan decided to throw in a quick footbreak before his drift forcing the following riders to drift a little early. Once the three of them were sideways they were as tight as a heat could be on this course! All riders made it out of the turn clean, going into the final left with lots of speed. Approaching the finish racers were tight, but holding his lead was Ethan. 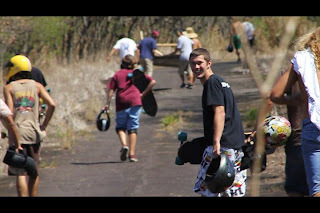 Right behind him was Keola then Eric. Shortly after the final we ran the consi’s where Brian and Mason raced tight with several passes. Mason would be the victor, making him 4th and Brian 5th. Everyone cleaned up the course then headed down the street where the awards would be. The sponsors really hooked it up for this event treating riders with over $1000 of total prize giveaways! Boards, wheels, trucks, bushings, clothing, and everything else a scorched skater could dream of. All in all event 2 of the Hawaii Winter Outlaw Series was a huge success! Thanks to all of the racers for coming out. Also a HUGE mahalo to the companies who supported the event to help make it possible. We will see everyone at the next event, The Night Owl Time Trial Of Lust on November 12. Check WheelTurnerHawaii.com for details. CheeHoo. THE SCORCHER 2 is TOMORROW!